Michelle comes from an aviation background and brings over 15 years of managerial and project management experience to BP&M. She has a reputation for getting the job done—on time and on budget. Her instinctive ability to decisively plan, shape winning teams, and deliver sound business solutions has helped clients realize new efficiencies and get the most out of business processes. She held several national management roles during her tenure at NAV CANADA, the country’s private sector civil air navigation services provider, and has led numerous strategic projects which have benefited internal stakeholders, airline customers, the general aviation community and the overall business. As the lead manager responsible for the Canadian Air Traffic Control (ATC) and Flight Service Specialist (FSS) Selection Program, Michelle headed the design and implementation of a competency based online recruitment and selection process aimed at identifying prospective candidates. Recognizing the opportunities and benefits of leveraging cutting edge technology, Michelle laid out a vision which introduced new concepts and ideas for her department and a team of outsourced subject matter experts. The successful outcome of this multifaceted project demonstrated Michelle’s leadership abilities and her capacity to deliver unique and proven results. Following the launch of the program, in 2012, Michelle was chosen to represent NAV CANADA abroad and introduce the Canadian ATC Recruiting and Selection Program to Saudi Arabia counterparts at the General Authority of Civil Aviation. In addition to being recognized by NAV CANADA for her accomplishments, Michelle’s memorable achievements include her selection as a finalist for the Mercer Vision Award for Human Resources Innovation in the design and implementation of a unique human help program, as well as being the recipient of the International Association of Business Communicators (IABC) Excellence Award for Marketing Communication recognizing an entrant who contributed to the organization’s overall business strategies. In support of service to her community, Michelle co-chaired NAV CANADA’s United Way campaign in 2008 and provided leadership, guidance and encouragement to regional committees across the country. The campaign not only exceeded established goals but surpassed previous years’ achievements which remain unmatched. Raising money in support of local charities has remained a highlight of her career and she looks forward to continuing her support. Michelle graduated with honours from the Business Management program at Algonquin College, School of Business in 1995. She recently completed her Master’s Certificate in Project Management at Carleton University, Sprott School of Business which focused on project planning and control, communication, quality and cost management, procurement and contracting management and assessing and controlling risk and has earned her PMP (Project Management Professional) designation from the Project Management Institute. 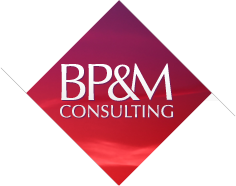 BP&M is a privately held management consulting boutique dedicated to helping the Canadian federal government transform how it does business.